Growing up, my dad had this clay figurine of a set of three monkeys which later I realised symbolised Gandhiji’s teaching of – “don’t see evil, don’t speak evil, don’t hear evil”. Unfortunately, like with many of his teachings we neither updated them for the new world nor used those that are still relevant except for politicking. Yesterday marked the 25th anniversary of the exile of Kashmiri Pandits from Kashmir. It is one of the largest exoduses in recent times – anywhere between 100,000 to 350,000 moved out of their homes and were called refugees in their own country. 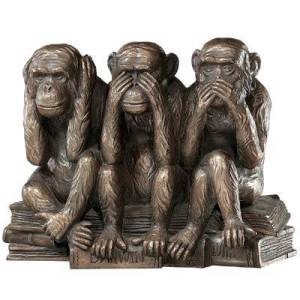 We saw no evil, we heard no evil and we spoke no evil and thought that the three wise monkeys of Gandhiji would have been happy … Well they died, right when the partition happened and trainloads of dead human beings came and went :(. These wise monkeys died over and over again – during the Nellie massacre in Assam in 1983, where anywhere between 2000 to 5000 people were killed. They died again a year later in 1984, when 3500+ Sikhs were massacred in the very country’s capital that they defend the borders of…and they still await justice. The killers roam at large, some died naturally and some have lived a normal life still. These wise monkeys died yet again in 1989 during the Bhagalpur riots, in 1992 during the Mumbai riots, in 2002 during the Godhra riots, in 2013 Muzzafarnagar riots. We see no evil, we hear no evil, we speak no evil. Our silence killed these wise monkeys. When you don’t raise your voice against evil and let it be, you kill the monkey that hears no evil but is able to see and speak. When you don’t react on hearing about evil and let it be, you kill the monkey that sees no evil but is able to hear and speak out against it. When you are unable to speak out against evil but are able to see and hear and don’t “feel” horrified, you kill the third monkey. We have effectively found a way to kill the wise monkeys and remain spotless in our thoughts. Read about what happened on 19 Jan 1990 in the Kashmir valley – Kashmir – the frozen memories. May the belief that some of us have in rebirth be true and may the three wise monkeys be reborn amidst us and may we not remain a deaf, mute and blind witness to evil. Sexual Harassment – the many who escape ! I have not read your post. The only thing that interested me was the fact that someone still remembers the 3 monkeys. I have just returned from India and have left my contribution with the people I met there. I said we must remember the 3 monkeys Gandhiji introduced us to but with a little difference. And I would like to add one more in the line up. My 4th monkey – THINK NO TRUTH. One of the fascinating facts of living in India.